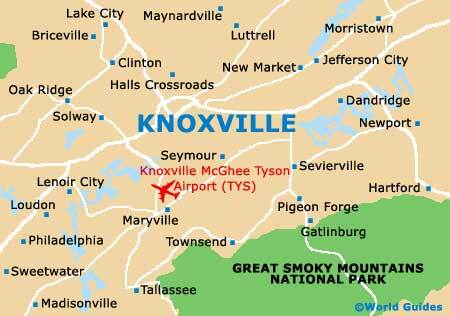 The city of Knoxville stands in the Great Valley of Knox County, on the eastern side of Tennessee. Close to the Appalachian Mountains, the city is intersected by the scenic Tennessee River. Knoxville was once the territorial capital and is now home to the prestigious University of Tennessee. With many tourist attractions centered around the downtown district, Knoxville is the perfect place for exploration of the region. 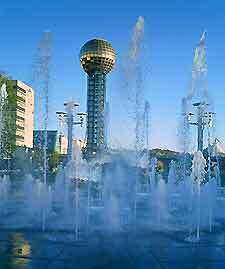 Tourism highlights in Knoxville include the Neyland Coliseum sports stadium and the Sunsphere tower, part of the city's World Fair, held in 1982. Hotels are readily available throughout Knoxville, in the city center, on the outskirts and in neighboring towns and cities, such as nearby Oak Ridge, Maryville and Pigeon Forge. There is a large selection of accommodation options in Knoxville, ranging from budget motels along Central Avenue and Merchant Drive, to many popular mid-range hotels concentrated on Langley Place, Summit Hill Drive and Peregrine Way. More information about Knoxville Hotels. Tourism in Knoxville is becoming an increasingly important part of local life and the city offers a number of tourist information centers. 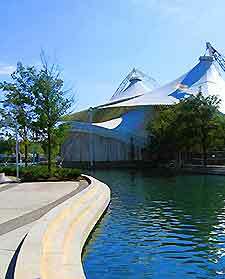 The main outlet in the city is the Knoxville Visitor Center on One Vision Plaza, which contains a range of tourism leaflets, travel timetables, booking services and information about sightseeing around the downtown district, Old City, World's Fair Park and the University of Tennessee. Knoxville has many popular tourist attractions, including the Bijou Theater - a popular centrally located cultural venue, featuring a range of concerts and performances; Ijams Nature Center - a scenic environmental park located on the Tennessee River banks; Knoxville Zoological Gardens - containing over 800 animals including educational information about the species; the Sunsphere - a striking tower located in World's Fair Park, with observation decks and panoramic views of the cityscape; and the Neyland Stadium - part of the University of Tennessee campus, hosting mainly football games and other major sporting events. Other main tourist attractions in Knoxville include James White's Fort - a particularly important historic fort once home of the city's founder, General James White; Blount Mansion - an imposing National Historical Landmark, with exquisite furnishings and antiques; Ramsey House Plantation - a listed Georgian house, reputed to be Tennessee's first stone house; the Alex Haley Statue - an eye-catching giant bronze statue of Pulitzer Prize winner Alex Haley; Crescent Bend - a charming example of an 18th-century farm, with landscaped Italian gardens and fountains; and many parklands, such as Knoxville's scenic Concord Park, Lakeshore Park, Tyson Park and the University of Tennessee Gardens. 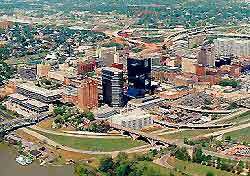 More information about Knoxville Tourist Attractions and Knoxville Landmarks. Some of the top museums and art galleries in Knoxville include Women's Basketball Hall of Fame - actively promoting basketball for women, with memorabilia and game information; East Tennessee Discovery Center - a popular science center with educational exhibits and natural history information; the Museum of Appalachia - dedicated to the history of Appalachian life; the University of Tennessee Football Hall of Fame - celebrating over 100 years of football, with historic sporting information; the Knoxville Museum of Art (KMA) - a modern building containing five separate galleries; and the Ewing Gallery of Art and Architecture - focusing on modern art and architecture. More information about Knoxville Museums and Knoxville Art Galleries. Tourist attractions located near to Knoxville include Dollywood - a world-famous Dolly Parton theme park to the southeast of Knoxville in nearby Pigeon Forge, next to the Great Smoky Mountains; Allegheny Springs Retreat Center - a popular excursion, standing at the base of Chilhowee Mountain; Farragut Folklife Museum - with an impressive collection of East Tennessee artifacts and historical railroad information; Palace Theater - showcasing regular acoustic concerts, movies and shows for children of all ages; Sam Houston Schoolhouse - a historic building around 10 miles / 16 km from the city, listed on the National Register; and ThunderWorld USA - a major family bowling attraction close to Maryville, with additional amusements and go-karting. More information about Knoxville Attractions Nearby.